The time has finally arrived! Yep! It's time for the newest released stamps from Peachy Keen Stamps to be revealed! Welcome to our blog hop!! You should have arrived here from the wonderfully creative Kim Score's Paper Punch Addiction Blog, but if you just happened along, you're definitely going to want to go back to the beginning and start at the Peachy Keen Stamps Blog so that you don't miss one amazing creation! I am so excited for you to see ALL of the new stamps, and especially the set I'm showcasing. This is the first in the series of Hillbilly Holler Stamps. These stamps were illustrated by Steve Yarbrough, a local Missouri artist and relative. These images are fun, funny, and oh, my! Don't get me started on how much fun they are to color!! For my first project, I took the Hillbilly Get Well image and made a cover for a Kleenex box. As good as a card is when you're sick, I couldn't help but think why not go one better and make the get well wish something that can actually be used and enjoyed. So, I found the pattern for this Kleenex box cover on Splitcoaststampers. This sleeve fits right over a Kleenex box, and can be reused. What a way to bring a smile to someone's face, who might not be feeling well. My second project is a little sign for the bathroom door. This little outhouse image is so darned cute!! If you're familiar with hillbilly lingo, you know that the outhouse is often referred to as "The Privy", so that's what I decided to put on my sign. Here's a closer picture so that you can see the hardware a little better. The keyhole comes from Tim Holtz, and the rest of the hardware is from Stampin' Up! And now on to my third project. When I saw this cute little guy in his nightshirt with candle in hand, I immediately thought it would be cute to make a tag using this image and secure it around a candle. No worries, though, because this candle is battery operated. You Light Up My Life is the perfect sentiment for this image. There's more weathered wood embossing on this tag, and more of that Stampin' Up! hardware, as well as the ribbon. Here's what I actually did with my candle. It sits in the kitchen on the butcher block, and looks so sweet at night when it's all lit up. I put it in a wooden box, and added a spray of berries and stars for filler. It's so stinkin' cute!!! And finally, I have a card to share with you that I made with this cute bass playing hillbilly. This guy actually reminds me of Hank Williams Jr. Ole Bocephus himself dropping by to wish you a Happy Birfday! I've even seen a wash tub bass being played at one of the shows in Branson years ago. Now THAT'S some hillbilly country fun!!!! All images were colored with Copic markers, and I've hit the Tim Holtz distress inks pretty hard for all of these projects. My two favorite colors for these creations were tea dye and walnut stain. I hope you like what you've seen, and have been inspired to create something wonderful with these new stamps. Cards are just the beginning of what you can do with these wonderful stamps and images!! Congratulations to you!! Angelica will be in touch so you can claim your prize!! THREE MORE chance to win! Just mosey on through the blog hop and leave a comment for each of our designers. The more comments you leave the more chances you have to win! I will choose three winners on Monday morning across ALL blogs in the hop! We'll announce them on the Peachy Keen Stamps blog Monday night! 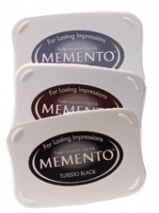 PRIZE 3: All THREE Memento Ink Pads pictured! Thanks so much for stopping by! Have a blessed weekend, and happy stamping! Your next stop on this hop is at the very sweet and talented Heidi's Blog, but should you get lost along your hoppin' way, below is a complete list of stops. These fellas are too cute. You did a great job bringing them to life. Very cute, you did such a great job. I love all of them. Lorie you have rocked this hop! You used the images in such great ways! I love the tissue box idea and your coloring is flawless! I love it!!!! Makes me want to be a hillbilly!!!!!!! WOW So many cards. I love the combination of the new stamps with the wood effect. Wow great projects!! Love the tissue holder! Very cute Cards!!! Love the tissue holder! These are so funny. I really love the tissue box. So stinking funny!!! I love your coloring and the presentation is perfect!!! You are a true artist! OMG Lorie you have been super busy. What Fantastic creations. Those stamps are so sweet and funny. WOW what talent. I love this guy..:) What awesome creations you created girl!! Awesome coloring. oh my goodness this is hilarious!!!!! just too funny! Hysterical collection! It'd be great fun to own. Thanks for sharing. Lorie...you've just surpassed yourself with bells on with these projects!! Stunning is too little a word to describe how talented and imaginative you are!! Fabulous stuff my friend, simply fabulous!! Oh I Love these stamps and your projects are so wonderful-you are very talented! Loving the hillbilly! Could be because I live in Tennessee! LOL! You ROCKED the new stamps Lorie! I love all your projects :) TFS! Cute projects. Thanks for sharing. Fabulous projects--I really like the bathroom sign. This is my first Hop and I didn't realize that I have to enter the word varification, so I am going back and filling in the blanks. This is fun! I LOVE these new stamps! Oh My these are too cute I love the images and very cute projects. The tissue box cover is true inspiration! Thanks for showcasing these hillbillies and thinking outside the box! haha these stamps are hilarious! I'm loving the tissue holder! Wow! Lorie, you have been busy!! I absolutely love each project! You coloring is amazing. I love these images. Thank you so much for sharing your talent. I LOVE this guy!!!! SOOOO cute!!! How fun is that HillBilly - you did such cute things with the stamps!! OMG, you have just OUTDONE yourself..these are just great, can't wait to get ahold of these! Love this stamps set, they are so funny. Your projects are AWESOME. TFS. Wow--your work is fantastic! Hilarious projects! These are a hoot! Love those little Hillbillies. Such creative projects too. Great job highlighting the beard. He is adorable. What a hoot! Love the hillbilly fun! TFS! hehe...this set is too funny! Great job on them! How cute! I love that tissue holder! OMG!!! These stamps crack me up!! Love all the projects you made!! I knew as soon as I saw the sneak peek of the hillbilly with bunny slippers I was gonna love these. Now that I've seen what all you did with them I'm even more sure, I CAN'T believe I won them!! Your projects are too funny! I love um! These are all hilarious in content and beautiful in coloring. So many ideas.....so little time! All of your projects are wonderful! I love the tissue box cover! TFS! Lorie, these are ALL FANTASTIC!! Omgosh!! The images are such a hoot and the projects you've made to showcase them are INCREDIBLE!! Wow, GF!! These are HILARIOUS!!! Thanks for sharing!!! Great job with the new hillbilly stamps. Love that tissue box. What a nice gift for someone under the weather. Fabulous cards, awesome job with the copics, and the distress inks!! All of your projects, are absolutely adorable. My fav is the kleenex box with all the TH adornments. This is just the funniest set. Could be used for everything, but what I like about it, is the adorable male cards that can be created with it. I simply adore the kleenex cover...Amazing...your talent is awesome !!! tyty4s...i will return to your blog to visit!!!! These stamps are quit hilarious you did a great job with your projects. Lorie... you have been so busy! These are just incredible! I love the tissue one... so cute! i love the door hanger, the candle and the card! The Hank Williams comment... cracked me up! As always you are so talented and amazing! I love all of your projects such great ideas. The stamps are funny!! Your projects were so different and clever. The tissue cover is great. Thank You for sharing in the hop. heeheehee...LOVE the kleenex box cover! Your creation are sooo darn cute and clever...just became a follower!! Your coloring on these fellas is fantastic!! absolutely love that tissue box! What a great idea! What an incredible artist you are! Your projects are too cute - loved the tissue box! What a fantastic job you did on your projects!! These are amazing projects! Super fun! These projects are my favorite so far! I just love these Hillbilly stamps and can't wait to get them! What an awesome job you did showcasing them! OMGosh! You did an amazing job! I LOVE it all! The Kleenex box is classic! Fun projects! Those hillbillies are hysterical. Thanks for sharing. Oh this projects are just so funny! How much fun you must have had making them! I love these hillbillies!! They are so funny and cute! Wow! You did an amazing job with your projects. Love your creativity. TFS! what great projects and so good with the new set of stamps. You inspire me to do great things. Thanks for your time and talent. OMG! these are so stinking cute! I love the Kleenex box! Great idea. your coloring is fantastic! Stinking cute, hillarious!! Love the colors! That little hillbilly guy is adorable. What a great job of coloring! Thanks for such creative projects as well. Too funny - this set is just too cute!! What a cute bunch of hillbillies lol. I think your shading on these is just amazing, GREAT job. WOW is all I can say. You totally ROCKED this set!! Holy Cow Lorie....I mean is your house like WIlly Wonka and the chocolate factory???? You see the smoke coming out and you know they are behind close doors working but you never see anyone coming and going???? How the heck do you have the time to do all of these fabulous things?????? I couldn't even do one in the amount you did a gazillion! I want them all!!!!!! These guys are really funny. Great creativity! LOL Those stamps make me laugh!!! Your projects turned out so cute! TFS! Yup...super duper cute! Love them! These are great! This was the sneak peek that stumped me so I am glad to see the final!! My favorite has to be the tissue box...just because I think it would put a smile to my face if i were sick :) Your copic skills are amazing! This set is so different. It really makes me smile. Your work is fantastic. thanks for sharing. So very cute! Love them! omh gosh i so love these fella's!!!! Sorry for the wording here...but these are just to stinkin cute!! I love them!! Wow, you have been busy. Your projects are all amazing. You are fabulous with the coloring. I want these stamps now. So darn cute and lots of possibilities. Thanks for all the inspiration. What cute cards and perfect for that special guy!! Thanks so much for sharing!! This set is a must have. I love how you cover a tissue box and made your other projects. They are too cute. hahahaha... love it all. What a great set. Wonderful stamp set! Love the Hillbilly! Love the bunny slippers on that guy! Too cute! So funny! Love your creations! Lorie, this are amazing projects!!!!! Love the Hillybilly stampa, they are really cute. Love the Hillbilly stamp set. Ok after seeing these I so gotta get the new stamps, perfect from a good old gal from west by gosh virginia LOL. thanks for the chance to win! I could use those blocks too I'm just starting in all this! You did a great job on your projects. Love all your projects - was trying to pick a favorite but couldn't. Thank you for sharing. This set is just amazingly cool. Soooo need to save up to get it. Would totally rock to have it. Cool! Now I wish I could get my hands on the pink acrylic blocs. Aren't they the feminine way of stamping! Lorie, I did want to tell you that I have a little something for you on my blog. Please stop by! I just love your card. Thanks for sharing. You certainly did these stamps justice!! Your projects are wonderful and the details are fantastic!! Looks like you'll be needin' to stock up on some of your brown inks!! :-) TFS! These are all so cute! I love the kleenex box idea. OMG these projects are awesome! I do have to say that my favorite is the kleenex box cover - too cute and hysterical! Well I laughed at the cards as they were so cute. Then I started looking at the incredible coloring you did and my jaw started to drop. I do not own any copic markers and I hear a lot about them, but my friend, you simply out did yourself on this project. You've out done yourself this hop! WoW!!! I love the little "Privy" sign, that is too super cute! I really adore the way you used all the little hillbillies stamps! They are so fun! Fabulous projects! Thanks for sharing them. Love all of your projects with this stamp set! Wow!! The Kleenex box cover is an awesome idea! Your work is amazing! Just popped over from Peggy's blog to see your creations...my goodness, how fun and creative. Awesome coloring. Woah there partner! Looks like you had so much fun making these. I love them all especially the Kleenex box cover. LOL too funny. tfs. You are so talented...I must get these stamps! There are very little cards in the market like this and these are just great. Thanks for sharing! I so love the blog....these hops are awesome.